I was young when my family pulled out of a city to the backwaters of the country. Of the many heartbreaks I weathered, the loss of my small book club was the most debilitating. The civilisation I was uprooted from seemed oceans away. Children of the jungle had heard neither of Enid nor Blyton; Tintin to them was probably an ice cream vendor. What was unforgiveable however, they thought Bruce Lee was a beggar from Sumatra. Within a month though, I was to receive a fat envelope from my good friend Rakesh of the town. I still remember my ecstasy at the treasure it contained -a beautifully handcrafted magazine with separate sections of stories, tidbits and cartoon strips. He had named it Guddi, or The Kite. Fired by an unstoppable frenzy, within days I launched my own journal, thoughtfully christened Such is Life. We wrote both poetry and prose, drew cartoons and jokes, and wrote letters to each other’s editors. Between us, we exchanged a dozen issues of our manuscripts when suddenly The Kite vanished from my skies without a trace. Even though I persisted on the solitary path for another few months, not a syllable emerged from the corner of the earth that nested Rakesh. What fortunes or fates befell my sweet old pal remains a mystery to me till date. But looking down the rivulet of life, the careening canoe of scribbling seems to have a certain genesis in those months. I wrote sporadically in the next two decades and tasted the ink of both local and national journals off and on. But it was not before the year nineteen hundred and ninety nine when I registered a website with the now defunct Geocities, may gods bless its soul, and set myself free. Writing for my own space put paid to regret letters and swishing scissors of that vengeful race called editors. I was free to discharge my whimsical voice, and exhale and disgorge in the medium of choice. I penned verses on rain and fog, satires on political dogs, rainbows and twisters of life in my random monologues. but the sand goes where it is blown. Unaware of the world around it. at the mercy of the storm that engulfs it. The haunting voice of the narrator mingled softly with my senses. It kept echoing within the mazes of the brain even when I was away from the console. Jolted back to life, I kept thinking. What is one blog amidst the sea of babble on the Internet? One wisp of a sigh amidst a trillion thundering banzai? Voila! Such is Life became One Grain Amongst the Storm! I feel hardly in luck as I write this tonight, and the count is simply incorrect sequentially, yet, as Mr Wordpess insists, it is my hundredth living post. Congratulations on your 100th post Uma! Your careening canoe has found a safe harbor not only in your blog but also in the hearts of innumerable readers. May it also soon find a berth in a Publishing house of repute. Thank you for those reassuring words, Suresh! What better publishing houses can I find that my readers’ hearts? Congratulations and here’s to many more 100’s! And may we have the joy of seeing your words in print soon! Many thanks, Wanderlustathome, for the wishes. Happy am I to have triggered the memories of school days! That sure is 100 high quality posts … can’t believe though that you have limited yourself to so few in all these years. I am sure you have so much more to say and what you write is worth reading. On the occasion of Vishu (in Kerala) I wish you and family good times … and for you I wish greater journey in your journey through the sea of letters. I remember creating a geocities account too though the concept of blogging never came to me till 2008 or 2009. Look forward to a book from you now. Jayadev, here is wishing a sparkling and prosperous New Year to you and your family too on Vishu! I try not to cram my little space with flippant or casual posts but you know all that already. As for the book, the ship has pushed off the port and sailing due north. Hoping to meet you somewhere on the shores of the promised land. Many thanks to you, my friend. That’s good news … sail on, good friend! I hope and wish the same to you yet again! You have been writing forever, my friend, honing that craft. 100 is just a number, although a perfectly lovely one to wish you ‘Happy 100th’ and here’s to many more. Thank you, Marina. It is true I have been chiseling away but the true worth of my labours rests with eyes of the readers . Glad to have struck a note with you. Congratulations on completing 100 posts Uma. Although I have recently discovered you, I am convinced that your blog is much more than a grain. That is what WordPress tells me, Amit. There have been many more before. But I have always believed in contents rather than numbers. If you don’t consider me manically fixated, I’d insist I am just a grain amongst the storm but importantly, I am trying to hold my own. Heartfelt warm wishes and a bunch of congratulatory notes for you Uma. It is great to hear of your journey with words- thought, felt, spoken and written -because every visit to One Grain Amongst the Storm is at the same time reading what you write, speculating about the myriad terrains of your mind, listening to you and relishing the powerfully poetic expressions. I am one of your most avid readers and hope that I will continue to hear from you about all that matters and all that does not. Curious about those journals…does some shred of it remain with you? Post something from there please. I love the sound that the name Rakesh has. Was he from Bengal? As far as I know Guddi is Kite in Bengali. What I do miss in the post is a brief mention of your experiences with what we have come to recognize as social networking sites. How have facebook or twitter been as co passengers in this journey? Hope the next hundred posts come fast, fresh and of course hot!! Amit, I am grateful to the Almighty for sending patrons like you down my way. Such glowing compliments will keep me going come hail or high water. Sadly, there were no backup copies of the issues in the respective publishing houses except for rough drafts. Although a few of them may resurface on extensive excavation of my paternal residence -along with the odd copy of The Kite, I am afraid they may be lost forever. Rakesh’s family hailed from Bihar. Guddi is a popular reference to kites in Varanasi too. His is a hopelessly common name and I have always failed to find him over the Internet. I never tire of saying I am quite a Thomas Pynchon sans his genius when it comes to socialisation and social media. I hate intrusion into my personal space and social media is brutally probing. Yet, I try to extract some juice from them some times and I do succeed occasionally. 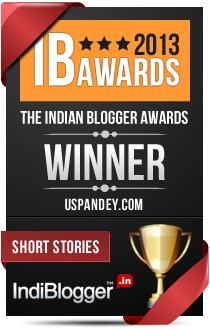 However, I have received great readership and support from blogging communities like Indiblogger and Blogcatalog. Although it is hard to predict the course of one’s life but I do intend to hang around my blog in reasonably foreseeable future. And I am sure I am good enough for at least another century. Thank you, Anupam. I trust I will not fail your hopes. You are blessed with such a heartfelt grounding in literature. I felt your boyhood anguish @ the Indian city to country move. The Prince of Persia is indeed inspiring, & I now understand your affection for Hemingway. Ian, that was a crushing event for all of us and we had felt crestfallen for long. I first came across Prince of Persia circa 1990 and was consumed by the mystery, adventure and the intrigue the game packed. Since then, I have followed the game version after version till now! Those lines acutely remind me of the littleness of existence in the worldly maelstrom. Yes, I adore Hemingway. I keep reading his works again and again. I have found few stories that are as powerful as Snows of Kilimanjaro. Congratulations, USP. You’ve had a fantastic journey as a writer and I think it is time to take your ‘craft’ on a bigger journey. I know there will be many of us rooting from the sidelines. Until then, do continue to enthrall us with your stories on this space. Corinne, I’d rather have you as a beacon than ‘rooting from the sidelines’. Trust me, with that kind of support I am all set for the voyage. Meanwhile, I promise to be around hankering for attention. A million thanks to you! Congratulations on your 100th post and what a post! May there be many more and I am sure there will be. I agree with Suresh, let the canvas be now vaster and the words encapsulated in prints ! However, succes can have its flipside too. Rowing your canoe upstream don’t forget the banks left behind. Do keep filling this space with many more engrossing reads for us, your avid readers and admirers. Geetashree, given a chance I’d still be fluttering my feeble wings for another 100 years but we all know life is shorter than that. I will still be here when I’d have supposedly crossed the Rubicon of Prints. I thank you a million times and I remain a humble servant of my patrons. Happy to have read your 100th post, bought back memories of another time, when my cousins and I wrote our own comics. We were inspired by the likes of Batman and the entire summer vacation went by with our own comic book industry in full swing. Alas we too do not have any copies of those rare collectors editions. They had a worth that cannot be measured by putting a monetary value on it. Hey, Subroto! Do I know that fever from the depths of my hearts! It is sad that we don’t even have the residues of the exotic potions we churned back then. Happy to have found a kindred spirit! Maliny, it is probably not feasible for Mr WordPress to excavate the pasts of the millions of subscribers. I should be able to keep the flame aglow with the support of friends like you. My backwaters happen to be up north, in the heart of the Gangetic plains. Many, many thanks! You may be just one grain amongst the storm, but you are one damn good of a grain I’ve ever met. Jyoti, it is a dream to leave an imprint on the sands of time. I am not sure if multiple centuries adorn my path in the unknown future, but I am sure you will find a footprint or two. Million thanks to you. Uma, you have such a wild and uninhibited way with words. You just turn on the geyser and let them flow. Expressions like “the careening canoe of scribbling” and “the mad slalom down the years” are absolutely priceless. It’s obvious you were born with the writing gene, no escape from your metaphorical fate, and I am more than glad to be on the receiving end of your poetic gifts. The passage from Prince Of Persia made me feel like I was looking into my own mirror. Ha ha! I do love that compliment! I hate to be bound and tamed and I feel blessed to have such exalted ears for audience. And I am eternally grateful to you for the compliment. I was also deeply touched by that passage, NP. It is not just you who is feeling mirrored, it seems to be the fate of each and everyone like us. After all, One Grain Amongst the Storm is just a synonym to Such is Life! Many congratulations to you for your 100 post. And I wonder if kids today will exchange books by post! Mridula, ‘paradigm shift’ sounds like typical corporate goo and has been irrevocably done to death but publishing is a landscape where it can surely said to have happened. I don’t know which way the kids feel inclined today -I will just focus on the path ahead. Thank you! Guess you have an idea now how it was like. So, forget it, my friend! Congratulations on your hundredth post, Uma. Each one is truly a gem-like grain against the storm. I’m so glad to have met you in the blogosphere. The pleasure is mine, Helena! Thanks for your kind words. Lovely US. You can never run out of luck, I am sure. Congratulations ! That’s one important grain amongst the storm 🙂 . Especially like the way you weave the words ! Thanks for the moonshine, Moonstone! It tends to get dark and lonely on Planet Writing. I will keep moving on. Congratulations for the 100th post! I am so glad you went to the country and made your first mark in the writing world! I am sure your words will continue to enthrall and inspire all of us! You are right, Richa. The forced qurantine turned me to books. And your words inspire me to keep scaling the mountains. Thank you for those cherishable words. Saru, those were days when J L Baird’s box was still to polute the serenity of backwaters. The folks there are nearly as informed as the animals of the metro today. Thank you, so much. Uma, you have reminded us all of the place of words in the hearts of children – and grownups, the connections we have to life and to each other, our longing for stories. Joan Didion said, “We tell ourselves stories in order to live.” It’s always a pleasure to read your writing. I hope you have given yourself a wonderful gift on the occasion of 100 posts! Molly, Joan Didion has a way with words. But for those stories, the void of our diurnal journey may become unbearable. Thank you for your kind thoughts. Wishes for more amazing stories/titbits to come.. I picked that up from the version of game released by Ubisoft in December 2008, simply called Prince of Persia. Since then, there has been a motion picture. I briefly checked the book at Amazon. It seems to be an interesting collage of memorabilia. Don’t know if that prologue is in their too. It is missing from the film. Wonderful Uma! Congratulations on 100 beautiful posts. Here’s to many more! Thank you for the wishes, Michelle. Thank you for the poetic compliment, Maitreyee. I just loved that! Radharani, that is a breathtaking perspective! Thank you for being my friend ‘unceilingly’ ! Hearty congratulations on completion of the coveted century! Actually, I’m long past that mark, Deepak. Of the 47 odd posts from my old blog at Blogger, I moved only 7 to WordPress. Congrats Umashankar on the 100th post. I really enjoy the way you play music with words. It is always a pleasure to read you. I think I used to have a website in Geocities too. My God that was ages ago. I had completely forgotten about it. Did it have a commenting system back then? I am not able to recall. The pleasure is mine, Jyothi. It is heartening to receive your appreciation. Many, many thanks. Geocities used to offer free hosting and I had a bunch of static pages. I guess technically it may have been possible to have interactive pages but I can’t recall the space and database related restrictions. It was so nice to read about the journey so far. USP, I salute your perseverance and all that you did to keep your art alive and going strong. You continue to inspire — in more ways than one. Congrats on the big milestone. And all the very best for the next 100. Here’s wishing One Grain Amongst the Storm a very long life and a whole lot of luck. Divya, I am grateful to have my loves’s labour acknowledged. Trust me, friends like you have been the wind to my sails. I do hope to stick around some more. Many thanks to you. Congrats on your 100th post and good to learn about your journey so far. Good to see it stretched so much way back. My lack of skill with the pen kept my literary passions subdued till computers finally freed me from the tyranny of the pen. Surprised at the origin of your blog’s name. Somehow the name always seemed to remind me of Prince of Persia. Thank you for your continued support, TF. Actually, the ease of editing in electronic typing has spoilt me too. I shudder at the thought of replacing an entire page for minor changes now -that is what I would do earlier. Actually, I remain deeply moved by Robert Browning’s dramatic monologues -the inimitable glimpses in the minds of the protagonists caught in crises. I once mulled naming my blog Monologues in Storm or A Melange of Monologues. Then came that chapter of Prince of Persia in 2009. What was unforgivable however, they thought Bruce Lee was a beggar from Sumatra. I agree. Not knowing Bruce Lee is unforgivable indeed! I penned verses on rain and fog, satires on political dogs, rainbows and twisters of life in my random monologues. Beautiful line! I wonder if Hemingway inspired you to write lyric within prose? If you write so well without luck, how wonderful you’d write with the help of luck! I’m waiting for that day (Maybe that would be the day you announce your book?). …simply incorrect sequentially, yet, as Mr WordPress insists, it is my hundredth living post. Congratulations on your 100th post, Uma. I loved this one. Thank you for your kind words and support, John. This is your first post I have read. But is shan’t be my last. This was a delight to read. One grain of sand is unimportant in a storm, perhaps. But the same grain attracts notice when the winds of life lead it else where. In the eye or your shoe, in your bread or in the shell of an oyster. I’ll come again- to gather some pearls. Welcome to One Grain Amongst the Storm, Dagny! Thank you for the gorgeous compliment. Congrats on hitting a 100. Not all editors are evil, though. Just opinionated, and risk-averse. Together, ‘opinionated’ and ‘risk-averse’ make a deadly combination! Many thanks for those wishes, Shovonc! Many thanks, Kripal, for reading some of my posts and those kind words. I seriously hope you will be reading more and more of them! A 100, eh? Congratulations. I’m at 99 and wondering what #100 should look like. I like your style.